First we bought a I.C.M. bar table, 30x42, and very happy with the look and quality. We were so impressed, we bought 2 30x30 tables to go on our new deck. They are very easy to assemble, and I like that all four legs have adjustable rubber inserts in the bottom to adjust for an uneven surface. These aren't cheaply made, are a good weight and the wind will not blow them away. 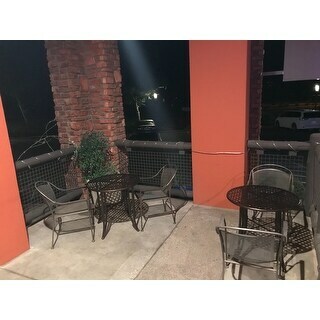 All 3 tables are outside under a pergola, time will tell if they are worth the cost. I believe they will be. Would definitely recommend this product. 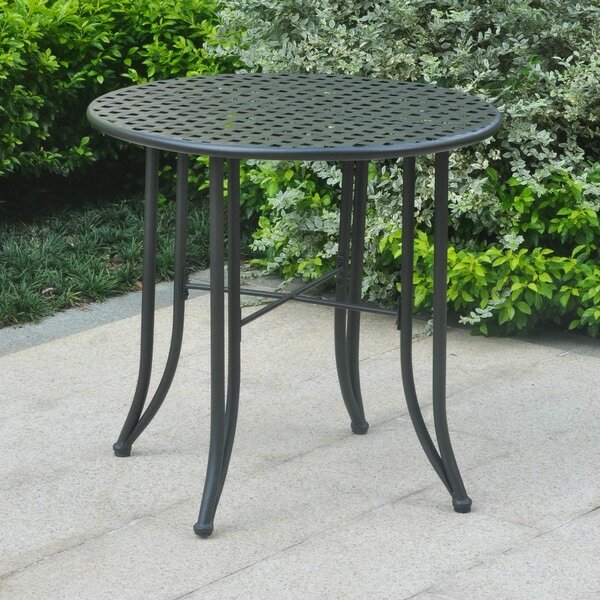 Add a touch of elegance and classic style to your patio or garden with this bistro table. This bar-height table features an elegantly curved 'Mandalay' design, is built with durable iron, and is available in a variety of powdercoated finish colors. This was a very nice and sturdy Bistro Table. The finish is on the Gray side which I preferred. The weight and scale were very nice! I would recommend this! I needed a table for my 38 inch diameter marble top. It fit perfectly and looks great. 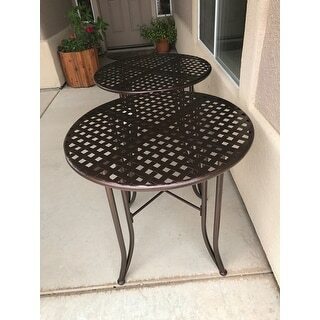 These tables are perfect! I bought three to use on the patio of our family restaurant, and I just love them. Lightweight enough to move easily, but not flimsy. And a lovely metallic bronze color. I ordered 4 Cayman Cast Aluminum Outdoor Chairs with the table which looks great together. The table is the right size for our small deck. It goes perfect with the Cayman Outdoor 7-piece Cast Aluminum Black Sand Dining Set by Christopher Knight Home we have on the lower patio. All of them make a great addition to your outdoors. The table fits perfect with the two bistro chairs I have. This table is perfect for our small patio space. I looks great with the furniture we already have and is doing just what I purchased it to do. Holding two dinner plates for us to eat outdoors and looking pretty. Nice table for the price. Surprisingly study. Color is black but given that it’s metal you could easily use craft paint to bronze etc. Reviewed June 18, 2017 Bistro table looks great on my front porch. It's just the perfect size for morning coffee or evening drink. Good weight. Easy to assemble. Do not buy these tables. They rust from the inside so every time it rains there is a big mess to clean up! Good looking, strong, study table. Only fault is that it does not have a hole in the middle for an umbrella. Great table and easy to assemble. Just love it. Am considering another. Love the table; it's exactly as expected. Very sturdy and attractive. It fit my small patio and coordinated with the chairs I already have to enable me to eat outdoors, as well as use as a side table for my grill. I was looking for a patio table to place between two chairs. Hopefully, it will not be too large. Just what I've been looking for. The price at this time was the main reason I was able to make this purchase. Thank you ! "How tall (height) is this table? Dimensions say 28.5", but description says "bar height."" We apologize for the confusion, this table is only approximately 28.5 inches tall. "Is this a set of two tables? The detail says only 1, but it says 2 in item headline. I need 4 total, but don't want to order 8"
This item features one table per order.